In light of Susan Sarandon’s recent statement, Lynn Beisner says she has to take a hard look at what it means in our society to be identified as a feminist. My world has been rocked by the news that Susan Sarandon does not consider herself a feminist. While most celebrities could not convince me to change toothpaste, what Sarandon says carries great weight for me. 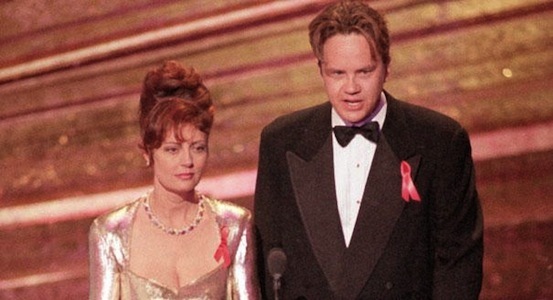 Sarandon became a role model for me after she and her partner, Tim Robbins, used their Oscar acceptance speech to bring attention to HIV positive refugees who were being denied treatment by the U. S. government. She took fire from both conservatives and progressives, with both calling her behavior “inappropriate.” It was also called a career-limiting move, and Oscar officials even raised the possibility that she and Robbins might be banned from all future Academy events. Sarandon’s words spoke to me deeply. At that time, I was still living in an environment where women were treated as less than fully human. When I objected, I was invariably told that I was being “inappropriate.” Realizing that they were right, that I had violated the rules for appropriateness, I would retreat and curl into a ball of shame. Sarandon made me realize that being inappropriate is a good thing when the status quo is harmful. In my estimation, Sarandon is a woman of relentless integrity who is not given to making thoughtless statements in the press. She is not one to be swayed by the anti-choice or anti-woman forces. She has proven that she is no coward, and she does not base her politics or ideology on what is popular at the moment. She has a spotless reputation for taking the side of the angels even when it could cost her dearly. She is not alone. In recent months the trickle of women who are deserting the label has become a stream. First, students were telling me that they supported feminist objectives but could not call themselves feminists. I assumed that they were ignorant about what feminism really is and I tried to educate them. It wasn’t long before I was hearing progressive public figures demurring from the label. It wasn’t hard to understand why they would. After all, people like Rush Limbaugh have done their absolute best to make sure that the word feminist is the other f-bomb and that it evokes the image of a woman so unattractive in spirit and appearance that no one wants to be around her. It is cultural baggage that few progressive politicians can afford to carry. I remained steadfast even when both of my children told me that they no longer identified as feminists. I was hurt and shocked. My first response was “Where did I go wrong as a mother?” They explained that I had done nothing wrong. They still were strong advocates for gender equality. The label just had too many negative associations for them. I remember saying something along the lines of “You do remember that your mother is not just a feminist, she is a feminist writer, right?” They informed me that of course they remembered; they just don’t consider me feminist. I told my children that they were wrong. I am not all that kind, but feminism is all about kindness. I tried to talk to them, but they didn’t want to hear about it. I tried to give them things to read, but they were not interested. It was clear that they saw me as loyal but slightly deluded, and as Sarandon said, terribly old-fashioned. And yet, they were still living their lives according to feminist ideals and both were still advocating for gender equality. And now Sarandon has rejected the label of feminism. I cannot dismiss what she says out of hand. I cannot chalk up her statements to ignorance because Sarandon is nothing if not intelligent and well-read. I cannot write them off to the whims of youth since she is older than my mother. She has taken stands that are both impolitic and likely to harm her career, so this has nothing to do with the stigma that conservatives have put on the label. I do not believe that she has suffered a conversion experience, and I can’t imagine that she has hooked up with a cowboy. In light of Sarandon’s statement, I have to really take a hard look at what it means in our society to be identified as a feminist. Am I clinging to a label that no longer stands for what I believe? If a woman with Sarandon’s integrity, history of work for human rights, and commitment to gender equality is rejecting the label, I have to give serious thought to why I am keeping it. The status quo of the approach we have been taking in our work toward gender equality does not appear to be working. Not only are we losing ground in areas such as reproductive health, our “brand” inspires less loyalty and enthusiasm than Spam. Maybe it is time for more than a rebrand, but also for a change in how we do the work of advocating for gender equality. I know that considering the option of abandoning the label and the current infrastructure of feminism may be considered treasonous. At the very least, writing such a thing here will likely be considered inappropriate. But I think that Sarandon is right; it is time for the status quo to change.